Now that we are playing in our Developer Tools sandbox, let’s iterate through some fields to see which fields are required. To use multiple lines, click the double up arrow in the bottom right corner. Note: I can’t stress enough how awesome the SDK is. Everyone I’ve met who partakes in the SDK creation, maintenance, etc. have been top notch people. If you aren’t using the SDK, you are missing out in tons of awesome tips, features and customizations. You’ll notice that the above code quickly goes through each field and checks to see if the field is required. We could also check if the field is dirty (meaning the user changed the value), if the field is enabled, or whatever. It’s just a simple way to make mass changes quickly. For the experienced developers, you may be thinking did IE get ForEach? 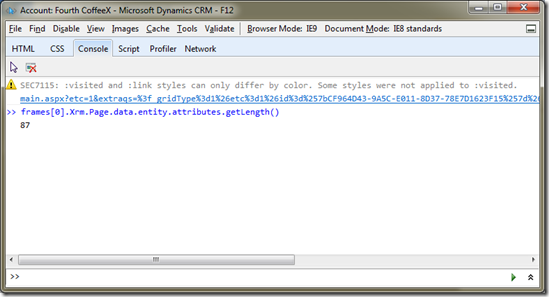 No, but the CRM developers were gracious enough to add this into the Xrm variable. For those of you unfamiliar, this was an old Mozilla thing that made life a lot easier when dealing with arrays. Expanding further, the Xrm forEach approach is faster than most arrays people would generate using for loops. You can write some JScript that is faster and I’ll get into that one day, but at this point you are better off using the forEach approach. I’ve said it several times, but I really like the Xrm object due to its attention to performance. In fact the method here is about a hundred times faster than iterating the crmForm.all object. I’ll back that up with some pretty graphs and such in a later post. Notice how easy it is to change what we are checking for. Whether we are looking for a specific value, dirty fields, required fields, or whatever, doing so inside the forEach function makes it fast and easy. To go from the Developer Tools back to the Web Resources, we need to replace all of the “frames.” references with blanks. IE Developer Tools is a great way to create and test our code without affecting anyone else and there is a lot more to developer tools than the console. I hope you enjoy!